Lightning strikes are a common and leading cause of morbidity and mortality. Multiple organ systems can be involved, though the effects of the electrical current on the cardiovascular system are one of the main modes leading to cardiorespiratory arrest in these patients. 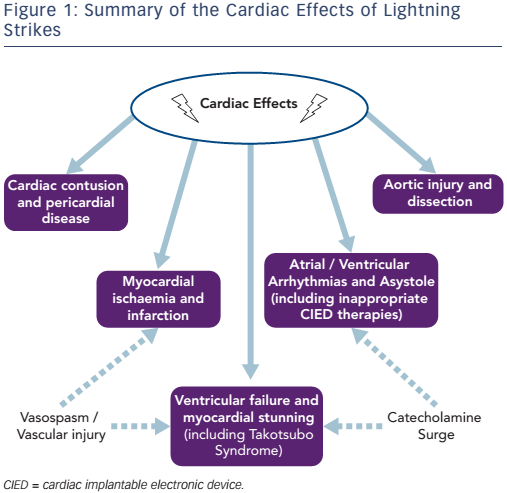 Cardiac effects of lightning strikes can be transient or persistent, and include benign or life-threatening arrhythmias, inappropriate therapies from cardiac implantable electronic devices, cardiac ischaemia, myocardial contusion, pericardial disease, aortic injury, as well as cardiomyopathy with associated ventricular failure. Prolonged resuscitation can lead to favourable outcomes especially in young and previously healthy victims. Thunderstorms with associated lightning occur in all parts of the UK throughout the year, with the highest incidence in the southeastern part of England between May and August.3,4 According to the Tornado and Storm Research Organisation (TORRO), in a typical year between 200,000 and 300,000 lightning counts take place, and of these approximately one in four will provide a cloud-to-ground electrical discharge. Though the passage of electric current typically does not damage or reprogram the cardiac implantable electronic devices (CIEDs), device therapy can be inadvertently affected if the degree of electromagnetic interference (EMI) is significant enough to overcome the electric insulation. Metallic objects of different sizes carried by victims, such as bra fasteners and safety pins have been reported to acquire magnetic properties in lightning victims.18 Furthermore, transient intense magnetic fields have also been documented to develop in the surrounding environment of a lightning strike.27 The above raise the theoretical risk of proxy sources for EMI if found close to the device pocket. ECG changes suggestive of myocardial ischaemia have been widely reported in the literature for some time.16,36,37 These include ST segment elevation and depression, as well as widespread T wave inversions. Furthermore, there is scarce evidence that there may be a correlation of localising ischaemic ECG changes with myocardial injury on autopsy specimens.13,38 Tachyarrhythmias described above may also have a secondary adverse effect by starving the myocardium of oxygen. Nonetheless some controversy still exists as to whether these can correlate fully with underlying pathological evidence of myocardial necrosis due to coronary-mediated ischaemia. Cardiac enzymes have been reported either as being elevated or within normal limits in patients who had ECG changes suggestive of cardiac ischaemia.24,39 This is not surprising as several mechanisms may have an impact on the levels of biochemical markers apart from coronary ischaemia, including cardiac contusion (which is reviewed below), tachyarrhythmias, acute kidney injury, leakage from skeletal muscle as well as the resuscitation process itself. Further studies are required to better correlate myocardial ischaemia as a direct effect of persistent coronary occlusion in these victims and thus identify those who would benefit from immediate coronary interventions after resuscitation. Cardiac contusion is an important mode of mortality and morbidity in children and adult victims. Even though this can lead to instant death, victims have also been reported to succumb to this type of injury days after the index event.18 In autopsy studies, haemorrhagic spots have been identified in areas not associated with large coronary vessels, as well as tracking along large unobstructed tributaries to the coronary tree. These areas can span the whole of the myocardium wall, from subendocardial to epicardial regions and there is often an associated myocardial tearing and haemopericadium with tamponade.18 The mechanisms of injury can either be related to the direct effect of current passage or secondary effects due to explosive environmental effects and blunt trauma. Depending on the extent of myocardial damage and degree of cardiac stunning, patients may develop cardiogenic shock which can be reversed with supportive measures.24 Elevations in cardiac enzymes including troponin and creatine kinase have been reported; however, the prognostic significance has yet to be determined.40 Cardiac contusion should thus be suspected in all victims who present with cardiovascular compromise and have features of impaired contractility and relaxation on their cardiac imaging. Finally, reference should be made to aortic trauma, as separation of the medial and intimal layers or medial defects, ultimately leading to fatal dissections, has also been well described.18 The mechanisms of these are likely to be similar to the ones causing cardiac contusion and the two pathologies can potentially co-exist. Lightning strikes can have devastating effects, with significant cardiac and non-cardiac complications. Over the last three decades, there has been a reduction in the case fatality rate.7,49,50 This can be attributed to several reasons including better public education and safety regulations for outdoor and indoor activities, lightning protection measures in buildings and other structures, as well as medical pathways and protocols to promptly tend to and manage victims effectively.7 Nonetheless, despite ease of access to more accurate weather forecasting and thunderstorm warning systems, people may still get caught in adverse weather. Key precautionary measures to limit the risk of potential injury during a lightning strike are summarised below. Any person who is caught in a thunderstorm while engaging in outdoor activity in an exposed terrain such as a hill or the seaside, should promptly seek an appropriate shelter. Promptly exit and avoid any body of water where the body will act as a peak or ‘beacon’ for a potential strike. Seek a well-grounded, enclosed building, or if this is not available an enclosed metal-topped vehicle (which will dissipate the electric current around the victim and directly to the .7 Hiding under trees can be a lethal decision as electric current from a potential tree strike can conduct to the victim from the trunk, or significantly injure the person from explosive decompression of vaporized sap.51 Furthermore, following a strike, it is important to avoid touching objects or building structures which are insulated from the ground, as they may retain electrical charge for some time.7 However, this does not apply to the body of a victim, and if cardiopulmonary resuscitation is required, including defibrillation, this should be initiated promptly. Cardiac effects of lightning strikes are an important mode of morbidity and mortality; these include benign and life-threatening arrhythmias, inappropriate therapies from cardiac implantable electronic devices, cardiac ischaemia, myocardial and aortic injury as well as cardiomyopathy with associated ventricular failure. Further research is required to identify prognostic markers, either with regards to the patient’s biochemistry or cardiac imaging results, in the acute setting in the ‘stable’ patient, thus establishing which ones may likely develop more sinister complications later on, as well as those who will benefit from close rhythm monitoring on discharge. Finally, as the association between electrocardiographic ischaemic changes and underlying coronary obstruction is not fully established, further studies are required in this area to identify which patients require to be rushed to the cath lab at an early stage, thus avoiding unnecessary invasive procedures. Christian HJ, Blakeslee RJ, Goodman SJ, et al. The Lightning Imaging Sensor. 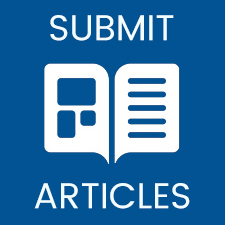 Proceedings of the 11th International Conference on Atmospheric Electricity, Guntersville, Alabama, 7–11 June 1999, pp. 74–9. Oliver JE. Encyclopedia of World Climatology. National Oceanic and Atmospheric Administration. New York, Springer, 2005. Prichard RJ. The spatial and temporal distribution of British Thunderstorms. J Meteorology UK 1985;10:227–30. Webb JDC. Thunderstorm Division review for Britain and Ireland 2013. Int J Meteorology UK 2014;39:135–40. Holle RL. Annual rates of lightning fatalities by country. Proceedings of the 20th International Lightning Detection Conference and 2nd International Lightning Meteorology Conference, Tuscon, Arizona, 21–23 April 2008. Williams J. USA Today: The Weather Book. New York: Vintage, 1992. Elsom DM, Webb DCJ. Deaths and injuries from lightning in the UK, 1988–2012. Weather 2014;69:22–6. Strasser EJ, Davis RM, Menchey MJ. Lightning injuries. J Trauma 1977;17:315–9. Browne BJ, Gaasch WR. Electrical injuries and lightning. Emerg Med Clin North Am 1992;10:211–29. Fahmy FS, Brinsden MD, Smith J, et al. Lightning: the multisystem group injuries. J Trauma 1999;46:937–40. Silva LM, Cooper MA, Blumenthal R, et al. A follow-up study of a large group of children struck by lightning. S Afr Med J 2016;106:929–32. Lifschultz BD, Donoghue ER. Deaths caused by lightning. J Forensic Sci 1993;38:353–8. Ekoe JM, Cunningham O, Jaques O, et al. DIC and acute myocardial necrosis caused by lightning. Intensive Care Med 1985;11:160–2. Jost WH, Schönrock LM, Cherington M. Autonomic nervous system dysfunction in lightning and electrical injuries. NeuroRehabilitation 2005;20:19–23. Taussig HB. “Death” from lightning and the possibility of living again. Am Sci 1969;57:306–16. Kleiner JP, Wilkin JH. Cardiac effects of lightning stroke. JAMA 1978;240:2757–9. Craig SR. When lightning strikes. Pathophysiology and treatment of lightning injuries. Postgrad Med 1986;79:109–12, 121–4. Wetli CV. Keraunopathology: An Analysis of 45 Fatalities. Am J Forensic Med Pathol 1996;17:89–98. Cherington M. Neurologic manifestations of lightning strikes. Neurology 2003;60:182–5. Morgan ZV, Headly RN, Alexander EA, Sawyer CG. Atrial fibrillation and epidural hematoma associated with lightning stroke. N Engl J Med 1958;259:956–9. Leiria TL, Pires LM, Kruse ML, et al. Struck by lightning: a case of nature-induced pre-excited atrial fibrillation. Circ Arrhythm Electrophysiol 2013;6:e20–1. Dronacahrya L, Poudel R. Lightning induced atrial fibrillation. Kathmandu Univ Med J (KUMJ) 2008;6:514–5. Palmer ABD. Lightning injury causing prolongation of the Q-T interval. Postgrad Med J 1987;63:891–4. McIntyre WF, Simpson CS, Redfearn DP, et al. The lightning heart: a case report and brief review of the cardiovascular complications of lightning injury. Indian Pacing Electrophysiol J 2010;10:429–34. Marcus MA, Thijs N, Meulemans AI. A prolonged but successful resuscitation of a patient struck by lightning. Eur J Emerg Med 1994;1 :199–202. Graber J, Ummenhofer W, Herion H. Lightning accident with eight victims: case report and brief review of the literature. J Trauma 1996;40:288–90. Cherington M, Wachtel H, Yarnell PR. Could lightning injuries be magnetically induced? Lancet 1998;351 :1788. Ginwalla M, Battula S, Dunn J, et al. Termination of electrocution-induced ventricular fibrillation by an implantable cardioverter defibrillator. Pacing Clin Electrophysiol 2010;33:510–2. Perret JN, Sanders TW, d’Autremont SB, et al. Ventricular fibrillation initiated by an electrocution injury and terminated by an implantable cardioverter-defibrillator. J La State Med Soc 2009;161 :343–7. Lappegård KT. Induction of ventricular tachycardia by alternate current due to an insufficiently grounded electrical system. Pacing Clin Electrophysiol 2012;35:e170–2. Chan NY, Wai-Ling Ho L. Inappropriate implantable cardioverter-defibrillator shock due to external alternating current leak: report of two cases. Europace 2005;7:193–6. Chongtham DS, Bahl A, Kumar RM, et al. Inappropriate shock delivery by implantable cardioverter defibrillator due to electrical interference with washing machine. Int J Cardiol 2007;118:e44–5. Von Olshausen G, Lennerz C, Grebmer C, et al. Shock whilst gardening--implantable defibrillators & lawn mowers. QJM 2014;107:147–9. Anderson DR, Gillberg JM, Torrey JW, et al. Lightning induced inappropriate ICD shock: an unusual case of electromagnetic interference. Pacing Clin Electrophysiol 2012;35:e159–62. Epub 2010 Sep 30. Kondur A, Afonso LC, Berenbom LD, et al. Implantable cardioverter defibrillators save lives from lightning-related electrocution too! Pacing Clin Electrophysiol 2008;31 :256–7. Sinha AK. Lightning-induced myocardial injury: a case report with management. Angiology 1985;36:327–31. Epperly TD, Steward JR. The physical effects of lightning injury. J Fam Pract 1989;29:267–72. Hansen GC, McIlwraith GG. Lightning injury: two case histories and a review of management. Br Med J 1973;4(5887):271–4. Andrews CJ, Cooper MA. Clinical presentation of the lightning victim. In: Andrews CJ, Cooper MA, Darveniza M, Mackerras D (eds). Lightning Injuries: Electrical, Medical and Legal Aspects. Boca Raton, FL, CRC, 1992; 47–70. Saglam H, Yavuz Y, Yurumez Y, Ozkececi G, Kilit C. A case of acute myocardial infarction due to indirect lightning strike. J Electrocardiol 2007;40:527–30. Rash W. Cardiac injury and death by lightning strike. J Emerg Nurs 2008;34:470–1. Karadas S, Vuruskan E, Dursun R, et al. Myocardial infarction due to lightning strike. J Pak Med Assoc 2013;63:1186–8. Xenopoulos N, Movahed A, Hudson P, Reeves WC. Myocardial injury in electrocution. Am Heart J 1991;122:1481–4. Gianni M, Dentali F, Grandi AM, et al. Apical ballooning syndrome or takotsubo cardiomyopathy: a systematic review Eur Heart J 2006;27:1523–9. Hayashi M, Yamada H, Agatsuma T, et al. A case of Takotsuboshaped hypokinesis of the left ventricle caused by a lightning strike. Int Heart J 2005;46:933–8. Dundon BK, Puri R, Leong DP, et al. Takotsubo cardiomyopathy following lightning strike. Emerg Med J 2008;25:460–1. Rivera J, Romero KA, González-Chon O, et al. Severe stunned myocardium after lightning strike. Crit Care Med 2007;35: 280–5. Elsom DM. Deaths caused by lightning in England and Wales, 1852–1990. Weather 1993;48:83–90. Elsom DM. Deaths and injuries caused by lightning in the United Kingdom: analyses of two databases. Atmos Res 2001;56:325–334. Elsom DM. Surviving being struck by lightning: a preliminary assessment of the risk of lightning injuries and death in the British Isles. Int J Meteorol 1996;21 :197–206. Jernegan MW. Benjamin Franklin’s “Electrical Kite” and Lightning Rod. The New England Quarterly 1928;1 :180–196.